About Mag+ Today’s touchscreen tablets offer designers a gorgeous and powerful canvas to create a new generation of digital publications. And digital publishing should be fun. So we built the Magplus publishing system to be as easy-to-learn and flexible to use as possible. We’ve put the creatives, not the tech team, back in the driver’s seat. That’s why Magplus issues are built almost entirely in InDesign, using a lightweight plugin for adding interactivity and rich media, so those elements become part of the layout and storytelling, not extras grafted on later. And with the Reviewer App, designers can instantly preview their work as they’re making it, fully functional on the iPad, seeing exactly what readers will see. It’s like having a Print button for the touchscreen. We had a chance to talk with Mike Haney, US Director of Mag+. iNews Design: Mr. Haney, please introduce yourself to our readers. Mike Haney: I’ve been with Mag+ since 2009 when I worked with the company as Executive Editor of Popular Science to design what ultimately became the first magazine for the iPad. In 2010 I became Deputy Director of Bonnier R&D where I helped develop the Mag+ platform further as we launched several additional titles. The following year I moved to MovingMedia+ as US Director. I’ve also worked as a graphic designer, which gives me some great perspective on what our customers are facing and the value our tool provides. iNews Design: Tell us about Mag+. What makes it special, different? • Mag+’s simple InDesign-based workflow puts full creative control in the hands of the designers, not the tech team. • Video, HTML5 elements and other interactive features are added directly in InDesign. • Mag+ is the only system that offers instant fully functional layout review on the iPad, allowing designers to try new things and see immediately what the user experience will be. • Mag+ tools are always free, so anyone can create fully functional designs at no cost. Payment happens when a new issue/application is ready for publication, at which point Mag+ offers a transparent and cost efficient solution (monthly subscription or per-use options). • After publication, users have access to a powerful web-based backend to manage users, issues and analytics. • The platform’s built-in features include analytics from Omniture, Localytics or Flurry; in-app subscriptions; Tapjoy, Admob and Appirator integration. iNews Design: At the market there is tablet publishing tools made by Adobe, Woodwing, Texterity/Wonderfactory. Mag + is at the market since April 2010. What is your goal. Mike Haney: We’ve been on the iPad since the launch of the device April 4, 2010. With the exit of Woodwing from digital publishing, Mag+ and Adobe are the only two solutions for creating custom publications for touchscreen tablets from InDesign, while others focus on repurposing print publications or RSS driven feeds. Within this landscape, Mag+ will continue to focus on our core strengths, which include creativity flexibility and ease of use. With its automated two-layer design, one-click integration of audio, video and HTML and instant review, Mag+ is by far the most efficient way for designers to create for the touchscreen canvas. We will keep simplicity and speed at the center of our product development so that designers can focus on creativity and using this canvas to best tell their story, and not on wrestle with complex systems and technical red-tape. Simplicity is also a driver in our other core focus: flexibility. We will keep offering designers the most options for presenting their information in a way that takes advantage of the unique touchscreen canvas. Our built-in two-layer architecture is one example of how we allow designers to really rethink their layouts in a way that is optimized for the infinite-canvas, touchscreen environment rather than simply treating the iPad screen like a smaller print page and confining designers to the edges of the screen. On the business side, we will continue to offer transparent and cost-effective pricing. With our free toolset and support for multiple versions of InDesign (CS4, CS5 and CS5.5), we aim to keep the cost of entry low so organizations can fully evaluate and test their plans before diving into this space. And with a pricing structure that ties costs directly to actions—an app build, the publishing of an issue—organizations will always know what they’re paying for. No ongoing licensing fees, no pre-payment. Finally, our option to host issues yourself or pay us straight data-transfer fees further reduces the upfront investment. We believe strongly that this market is still evolving rapidly and our clients need to experiment—in the creative, audience and revenue aspects—and learn, and our aim is to empower that experimentation. By doing that, we will all get better at using this amazing new device space to its full capability. 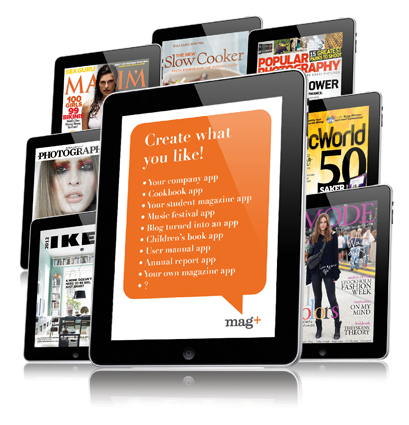 iNews Design: Can you name some publications, magazines that are using Mag+. Mike Haney: Popular Science, Popular Photography, Outside Magazine, TransWorld Snowboarding in the consumer space and United Hemispheres in the custom publishing space are among a few of our magazine clients. The benefits of Mag+ go beyond the magazine publishing industry. The 2012 IKEA catalog is an excellent example of how cutting edge marketers are able to leverage the technology to reach customers in a completely different way. We’re also seeing a rapid increase in the use of tools for corporate branding and communications material such as brochures, annual reports and sales materials. iNews Design: What are your plans for the future with Mag +. Mike Haney: Mag+ will roll out its next major upgrade in November of this year, with a completely redesigned and customizable storefront and issue library. It will also include native social sharing, revamped UI and Navigation and additional flexibility in the Mag+ plugin. All of these changes are aimed at supporting our clients in making their publications and apps more customized, more creative and more successful. This year will also see the launch of one-click publishing to an Android 3.0 tablet. Looking into 2012, we will continue to expand the canvases our clients can publish to, allowing them to create publications specifically designed for mobile devices and e-readers. At the same time, we will continually refine the UI on our tools and our backend to make the downloading, installing, using and publishing aspects of our system even easier and faster.